One of the most significant changes initiated by the Second Vatican Council was the direct encouragement for Catholics to rediscover the Bible. Unfortunately, education has lagged behind Catholic interest in exploring the Bible and its mysteries. Consequently, vital questions, including how to read and interpret the Bible, remain unanswered for many Christians. In Biblical Fundamentalism, Father Ronald Witherup offers Catholics a guide to the questions that arise when they desire to use 'the good book' in their personal lives. Father Witherup provides an overview of the origins, history, basic tenets, and problems with biblical fundamentalism and its influence in contemporary culture. He summarizes Catholic teaching on the Bible and points out both the strengths and the weaknesses in the fundamentalist approach to the Bible. He also provides a concise but thorough response to questions that Catholics have about fundamentalism and discusses resources for further study. Biblical Fundamentalism is divided into five chapters. The first chapter explains the historical origins of Christian biblical fundamentalism and why it is a uniquely American phenomenon. The second chapter outlines the main tenets of fundamentalist faith and how it approached the Bible. The third chapter does the same for the Catholic faith. The fourth chapter explores why biblical fundamentalism is attractive in our day and offers a critique of it. Finally, the fifth chapter imparts some practical advice about how to fashion a sensible (and courteous) Catholic response to fundamentalism. Ronald D. Witherup, PSS, PhD, is Provincial of the U.S. Province of Supicians and former academic professor of Sacred Scripture at St. Patrick's Seminary in Menlo Park, California. He holds a doctorate in biblical studies from Union Theological Seminary in Richmond, Virginia. He is the author of Conversion in the New Testament, A Liturgist's Guide to Inclusive Language, and is a contributor to The Collegeville Pastoral Dictionary of Biblical Theology. This is a very helpful and appropriate work for anyone living in our pluralistic society. At a time when literal interpretations of the Scriptures have become a significant part of contemporary social culture, Witherup provides Catholics with answers to many of the questions posed by evangelical fundamentalism. Through his primary focus is biblical interpretation, he offers a fine summary of various manifestations of religious fundamentalism. In addition to his clear explanation of this complex and challenging phenomenon, he suggests both do's and donts for dealing with it. Witherups honest and insightful treatment is both informative and pastoral in its implications. It should lay to rest the concerns of many even as it stimulates their interests. This is an important book. Father Witherup offers all interested Christians, especially Roman Catholics, a much needed, readable, intelligible, intelligent, and reliable study of biblical fundamentalism. Readers will learn much, so that they will understand how to evaluate and know how to relate to this kind of religious attitude in its multiple manifestations. This study is particularly helpful for those who are interested in serious study of Scripture. Biblical fundamentalism poses a real threat to Roman Catholics and their view of the Scriptures. With the learning and good judgment that comes from serious study and wide experience, Fr. Witherup responds to the threat and exposes the inadequacies of fundamentalism. His real interest, however, is in showing Catholics how to read the Bible in the traditional Christian way, a way that engages their interest and deepens their faith. I highly recommend this book. With knowledge, insight, and pastoral sensitivity, Witherup explains what biblical fundamentalists and Roman Catholics believewhere they agree and where they differ. . . . He invites Catholics to discover a more dynamic biblical faith within their own tradition, demonstrating how for them, too, the Bible can come alive in ways that are relevant for their daily lives. 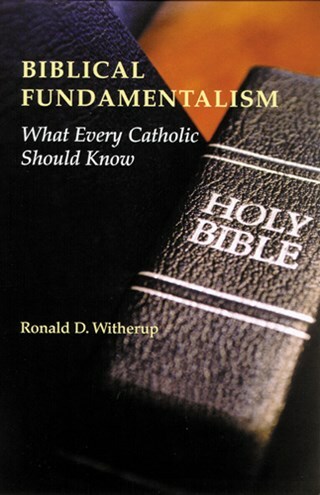 Here is a clearly written volume that summarizes what every Catholic needs to know about fundamentalism and the Bible. Those who read it appreciate anew the genius of Catholicism and its interpretation of the Bible.
. . . you distill down top-notch contemporary scholarship into a readable and easily-digestible form, appropriate for parish groups or introductory college classes. There are few pastoral resources that could be more welcome than this. Anyone who has had to deal with biblical fundamentalismin their parish, in their family, or at the officewill be grateful for this thorough, thoughtful, and pastorally sensitive approach to the issue. Catholic readers will find here what fundamentalism entails, how it differs from Catholic teaching, and ways to deal in a Christian spirit with fundamentalists themselves.